I am up to March of 2008 in my indexing, and it is a bit tricky, because I want an index of reviews, not an index of reviews along with responses/remarks/embarrassing dreck. I can't decide, for instance, if I should include what I wrote about The Missing Piece, by Shel Silverstein--the only post I've ever written that elicited a truly impassioned negative response from a general audience member! "I was very happy yesterday to find that someone had donated a lovely copy of Shel Silverstein's book, The Missing Piece (1970, Scholastic 1995) [to the library booksale]. I was even happier when my seven year old seized it and started reading out loud to us. For the first two thirds of the book, I was day dreaming about the glowing blog entry I would write about it. Then, betrayal. Total betrayal. The story is as follows- a happy-face (in profile) shaped piece is looking for his missing triangle. He rolls through the world, slowly because of the missing piece, smelling flowers, meeting various insects, and then encountering various triangles, one of whom doesn't want his identity subsumed by a larger shape, and many who just don't fit. At last he finds a triangle who fits beautifully, and is willing to enter into a relationship, and both shapes are happy. But not for long. With the new triangle in place, the shape now rolls quickly, too fast for nature appreciation. So what does the original shape do? Does he say, "Let's stop for a while, and rest, and I'll explore a bit but come back to you?" NO! He leaves the poor triangle, who looks sad and stunned, in the dust, and totally abandons it! What a jerk. The message of the story becomes this--if your partner in a relationship holds you back from doing the things you liked pre-relationship, dump your partner without apology. I'm just glad they hadn't had any kids." Gosh, I still am sore about the poor triangle. "It was just as good as I had hoped it would be. It is, in fact, the best picture book I’ve read since Scaredy Squirrel. 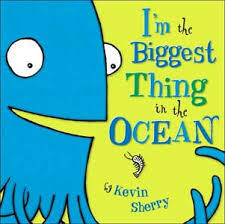 The “biggest thing in the ocean” is a Giant Squid, who smugly says on the jacket flap, “I’m bigger than this book!” Encounters with other sea creatures bolster his conviction that he’s the biggest, until the much, much larger Humpback Whale appears—bye bye squiddy. This is a powerfully illustrated scene (in a bright and playful way), showing the squid’s tentacles dangling horrifically from the whale’s mouth. We were a bit taken aback. Was squiddy gone for good? And don’t neglect to look at the back of the book -- “I’m bigger than this bar code!” says Squid, gleefully. In a nutshell, I might have to actually spend my own money on another copy of this book. My 4 year old does not want it to go to the library, and the fact that we are going to keep the complimentary bath clings with which it came does not mollify him. I don’t think that bath clings are really something that should circulate, somehow…"
Which no one commented on. Sob. I'd forgotten this cheerful (not) book, Mass Extinction: Examining the Current Crisis, by Tricia Andryszewski: "Leafing through it with my children, I had to close it quickly when we got to the picture of the seven legged frog." And the whole reading through back posts becomes intolerable for the moment when I get to a post wherein I had an embarrassing brain freeze and the author of the book I was talking about was unhappy. Life is so much better now that I am peacefully reading middle grade fantasy and science fiction. 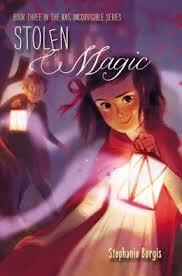 Today's happy book--Stolen Magic, by Stephanie Burgis, whose publication day it is! I really need to index my reviews, and I'm afraid of what I might find. Five years is longer than it seems. I might start working backward from the present...less distressing, although trickier to keep track of where one is. I remember your appreciation of I'm the Biggest Thing in the Ocean from the first time round. We checked it out and enjoyed it -- I should revisit it for old time's sake, and the younger one will almost certainly like it more this time around. I was also jealous of you for possessing the bath clings. The life of a book reviewer is quite an adventure isn't it? I often think about whether commenting on random or current (usually specific to me) events in the context of a review decreases its lasting usefulness-so much so that it stops me from reviewing it, which is another problem entirely. You manage a nice balance in your posts. Looking forward to Stolen Magic myself! I dunno--I like reading other peoples asides about their current events. And my own bits of my real life are one of the few pleasant things about reading my own old posts! I know, I like the real life bits, too! Will not worry about them then.